At Salon Success Academy, we provide our students the opportunity to train in a field they love and build their clientele while in school. We love sharing the transformations our students create on the salon floor. Juan Barajas is one of our many passionate students who believes in developing relationships with his clients. 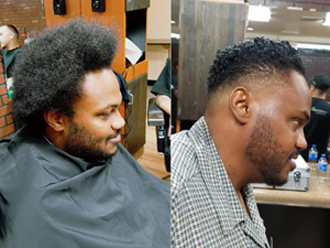 Recently, we shared Juan’s before and after photos on our Facebook page and several new clients, who have never received services at Salon Success Academy before, called in just to schedule an appointment with Juan! You too can maintain client relationships and even create new ones through social media! We believe in the power of social media to not only connect with family and friends, but to drive new and existing business for a successful career. Build your portfolio on social media and use Instagram to showcase your work to build your network. Social media is your best friend when it comes to building your barbershop customers. Create professional profiles dedicated to highlighting your skills and post video tutorials. Connect with other industry professionals including bloggers, YouTube gurus, and Instagram stars. Check out more of the great work our students do and visit one of our salons to experience the Salon Success Academy difference for yourself!